You want your home's exterior to look vibrant and new without compromising strength and security. Vinyl is a great energy efficient option for your home's siding and provides several advantages that offer the beauty, strength and value you are looking for. Changing the colors and style of your siding can give your home a new and vibrant look. So how do you decide what colors will best suit your home's style? Consider a color scheme that will work best with your home's location and match the styles of the houses in your neighborhood. If many neighboring homes are single-colored homes, yours may stick out too much if you go too dramatic with your vinyl siding color. However, in some neighborhoods, all the homes start look the same. So be different and bold but realize even though you want to put your stamp on your siding color scheme, you also want your selection to look good in your home's location. Luck for you, If your neighborhood is more colorfully assorted, you have more leeway when it comes to siding style and colors. You want the colors of your home to work together elegantly for an attractive and appealing look. Try to keep a scheme that matches the color of your roof and the accent colors around the exterior. Siding colors can be altered more simply but a roof typically lasts more than 30 years so your roof color should be an important factor to consider. For example, according to Better Homes and Gardens, If your roofing material is dark, it may motivate you to consider a lighter siding color scheme; a more neutral roof hue may allow more choices when it comes to exterior schemes. Also, your home's trim, shutters, corners, doors, and railing colors are all contributing factors to help decide what siding colors to choose. It's common for homeowners to choose trim that’s slightly lighter or darker than the vinyl siding. Your doors and shutters are a great way to throw in pops of color that still matches your desired style. Another factor to consider is the size of your home. If your home is smaller, try bolder and rich colors that create a dramatic effect that lets your home stand out. Lighter colors tend to make a small home seem smaller as it doesn't really have a strong element that helps to stand out. However, a larger home can utilize bolder colors but should avoid too dark because the home may start to look overwhelming and gloomy. Lighter and airier tones seem to make a larger home look more fresh and appealing as well as accent essential elements throughout the exterior. 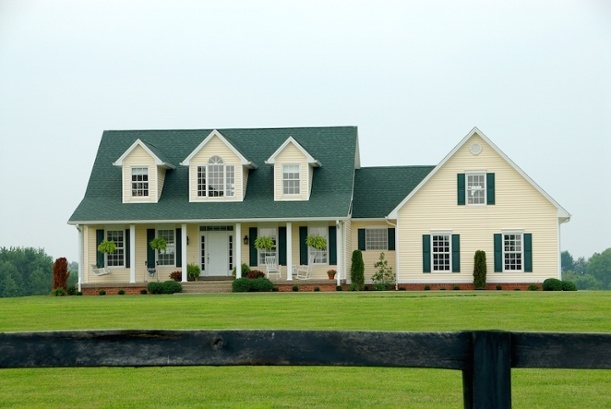 Is your home style more traditional, colonial, cottage or modern. Understanding the style of your home may also give you better idea of what colors will give you the best look. According to Better Homes and Gardens, colonial homes are often painted a single color such as white; unusual accents can offer a subtle, yet modern twist to that traditional scheme. Some home styles - cottage, country - may offer more freedom when it comes to choosing siding colors for your home. The most important aspect to remember is that your home is a reflection of you and you should enjoy the look and style of your home with whatever colors you choose. By installing quality vinyl siding, you won't have to scrape or paint wood shingles, or patch cracked panels. Vinyl siding is constructed so it won't chip or crack in the cold New England winters, or fade in the sun and summer humidity. You can even clean your home's siding with a quick and simple wash with a garden hose!